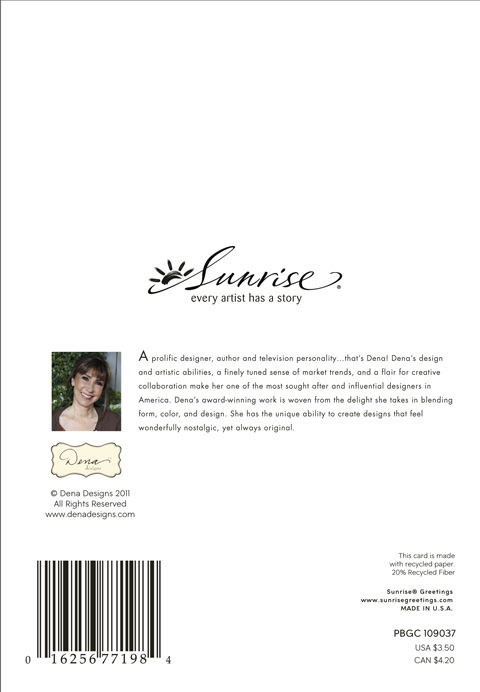 Sunrise- a full line card and gift offering within Barnes & Noble, The United States Post Office, Michaels, FTD, Office Max, Office Depot, Staples, Wegman’s, and hundreds of independent retailers. (Formats: Greeting cards, memo lists, pocket notes, mugs, gift bags, roll wrap, gift card presenters, memo cubes, stationery, and other paper-based and social expression gifts. I was sent to Sunrise Greetings in Bloomington, Indiana to lead editorial while the transition of all offices and the transfer of all assets were made to Kansas City. (I lived in a hotel next to Honda dealership for 6 months leaving for only 2 weeks to get married.) Sunrise was a creative mess. What little engagement was left in the staff who were about to lose their jobs, was spent on working on résumés and not the work at hand. I used this time to develop a rebranding strategy for Sunrise once the transfer to Kansas City was complete. This was to take Sunrise back to its roots- a brand that focused on the hand of the artist. I implemented new card-backs, new logo design, new tag-lines, new style guide, and new editorial strategy to make this line, at its core, an alternative studio/gallery with bolder, fresher designs and very few “Greeting Card Formulas”. I worked with my team along with an outside branding firm to create this style guide, a sort-of manifesto to give clear direction to where we were going and how to differentiate our brand from Hallmark. It also needed to be exciting and inspiring for all those on our team. I implemented new colophons for our four signature artists on our card backs and included a new version of our logo with new tag-line. Here are some examples of our new retailer catalogs. Please note I personally directed and conceptualized 80% of the cards featured in the following catalogs in collaboration with my art directors and designers. These are NOT consumer catalogs and therefore they are very sparse in design and editorial. They are vehicles of utility. ← WHAT DO OTHERS THINK OF MY WORK?